I wanted to learn to drive real bad. Let me reword that. I wanted to learn to drive real good. First, the mission jeep was just that. A mission jeep. My folks did not own it. It was owned cooperatively with about ten other families in the mission. Second, we lived in the hills. Some considered them mountains, but when the Himalayas in all their splendor are in your backyard, these had to be considered hills (they were commonly referred to as “the foothills”). The roads were steep and narrow. In fact when they were first built they were built for horses and rickshaws, and built long before motor vehicles. Another factor was petrol, as we called it. It was expensive. It had to be hauled up from Dehra Doon in drums. And it cost several times the stateside price per gallon. If you were driving down on the plains you had to share the road with every manner of beast, bicycle, car and truck, all vying for the same limited road space, and all seemingly indifferent or oblivious to the others. Of course all this was splashed with color and in the cities a cacophony of sounds. Here driving took on another dimension–a skill measured in millimeters. The fact that I was 13 and could hardly reach the pedals and look out the front windscreen at the same time had little bearing on my strong desire to learn to drive. But, like I said, fat chance. 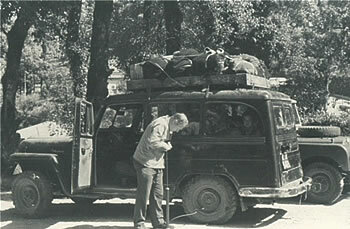 We consoled ourselves by learning all the types of vehicles on the road–not too difficult as there were only Fiats, Ambassadors (based on an antiquated British design of the Morris, but built in India), Standards (another British type of car), and Jeeps. Every now and then you would see an old American car. And we learned the gears on the mission jeep. First second third. Low. Low low. Four wheel. We watched carefully how the clutch comes out as the accelerator goes in. Pretty soon we had the theory down pat. All we needed now was the opportunity for the real thing. That opportunity came to us in a rather expected way. Dale Seefeldt was a senior. For an assignment in English he wrote an essay on the ignition system of a car, a seemingly innocuous subject. But it did have a certain functional value. Even as a senior his dad would not teach him to drive, and he wanted to drive sooooooooo badly. That essay was his first step. The second step was to get a bunch of us involved. My guess is that Dale figured the more who were involved the less we would be punished if we got caught—a diluting effect. And so late that fall in 1963, on a Friday evening we all assembled up at Kellogg Church where the mission jeep was parked. Someone took out the streetlight. Oooops. With the streetlight out Dale, Gordy, my older brother, Norman, my younger brother, Paul Seefeldt (in my class) and I sauntered up to the old green ’53 Willy’s station wagon. We found we could snake the long blade of a Boy Scout knife (which we all carried, de rigueur for all boys of our era) between the rear windows and push aside the catch. Once that window was open the rest was a cinch. We knew we were reasonably safe. All our parents were at the weekly prayer meeting–they were religious about this, in fact. And so from 7:30 to 10:30 PM every Friday we knew exactly where our parents were—and that they were probably praying for us. Once inside Dale went to work. He got out a couple pieces of wire with alligator clips on them he had rigged up. And then he began to snap them on various wires up behind the dash, a very awkward thing to do lying upside down on the floorboards. After a little experimenting he got the right wires and, stepped on the starter located just above the accelerator (remember this was an older jeep and you did not just turn the key to get it started). The thing roared to life. For whatever good it did, we all kind of ducked down as Dale eased the thing down the road. Our intent was to go around Childer’s chukkar a couple of times (the road that was somewhat level and went around the hillside). For never having driven before, Dale did great. Clutch out, gas down, jerk jerk, but we were off. Steering he did just fine. Unfortunately, as all of us know who have learned to drive, nothing comes automatically at first. You do one thing to the neglect of another. Coming around the last corner headed down the straight stretch just before St. Paul’s at Kushi Ram’s, Dale’s door came open from the centrifugal force of making the corner. He reached for the door, neglecting to steer. In that terrifying instant we all knew we were done for. We were rapidly headed for eternity when Dale, realizing what he had done, quickly turned the wheel at the last possible moment. Dale smiled broadly, but we knew he’d probably just wet his pants like we had. We drove on. Once we got past Firs, Dale stopped and gave us each a turn, explaining carefully what to do. The idiot. We knew how to drive! We had watched as carefully as he had. We still did a lot of jerking trying to get that clutch-accelerator coordination down. We only drove around the chukkar twice that night and had the jeep parked back at Kellogg’s well in time for the engine to cool down, and for us to be home when our parents got there. There was no sin we had committed up to now that had given such sweet anticipation for the next prayer meeting. Friday after Friday we honed our skills while our parents prayed. 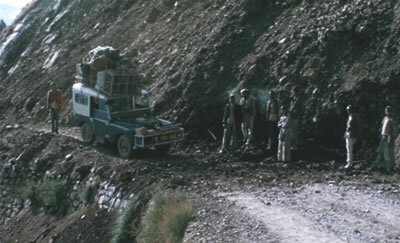 In fact, it was likely their prayers for us that kept us from driving off the hillside and killing ourselves. Each session was as conspiratorial as the first. We got the hot-wiring down pat. We learned to coast down the first stretch of road so there would be no chance of anyone hearing the distinctive sound of this jeep firing up. We learned not to drive too far in one night for fear someone would notice a discrepancy in the gas consumption. We were careful. And we were slowly becoming accomplished drivers. And so it went. Going down day in late November came and went. And we kept at it. It all came unraveled because of Norman and Paul. One Saturday in early December they accompanied Uncle Ralph over to Happy Valley to Deodars. And while he was catching up at the office, they goofed around. And in the afternoon they were at the yard at Deodars where Uncle Ralph had parked the jeep. And the object of our past several months of joyful sin was simply too much for them to bear. They got in, hot-wired it and drove it around and around the small yard. And, like idiots, they drove in circles until the yard was clearly marked up by their folly and the engine was hot. Uncle Ralph came out from work. He was talking to the chowkidar (watchman) as Norman and Paul got in. And while he was talking he casually put his hand on the hood of the jeep and jerked his hand back. It was more than warm. Norman and Paul were mesmerized with fear. Uncle Ralph had a clear and decisive way of exhibiting his displeasure, which they were soon going to experience in full force. Jonathan Edwards might have re-titled his famous message, “Sinners in the Hands of Uncle Ralph.” They did the only sensible thing–they spilled the beans. And quickly. All of them. Of course, this led to immediate groundings (or, as we called them, “gatings”–we could not go out the gate). Dad didn’t get mad often, but he got mad this time. We were restricted to our compound for two weeks and we were lucky we could go outside at all. WHAT were we thinking!? Didn’t we know we could KILL ourselves? How irresponsible could we get?? A two week gating ought to give us time to think. Fun had turned into serious business at this point. We discovered sin casts a long shadow. The worst of it was that each of us had to make a personal, private appearance before Uncle Charlie, the Field Chairman. Uncle Charlie was always busy in the Lord’s work. He tended to be a bit stern, had an angular face and an aquiline nose. For the most part we kept out of his hair and he kept out of ours. Until now. Just what sort of terrible judgment he would mete out in addition to the punishment we had already received left us expecting the worst. We each entered his private study at Bothwell Bank, where he lived and had an office, wishing Dale had never invited us to do such an insane thing. Uncle Charlie sat at his desk, stern as ever, the light from the desk lamp casting shadows on his face that Bela Lugosi would have been proud of. “Sit down, Steve”, he invited, not as harshly as I expected. Then followed a series of questions that were as predictable as going from first gear to second to third. With hung head and mortified spirit I answered the questions with equally predictable responses. 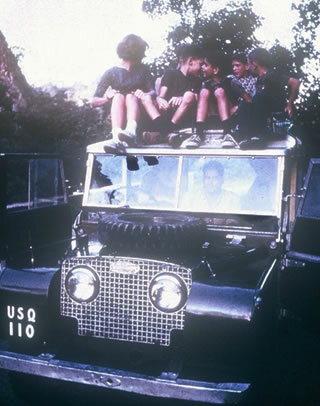 Shortly after the episode of learning to drive, Dad bought this Land Rover from the Maharajah of Tehri Garwhal…and allowed us to drive it under supervision. “Good. Let’s have a word of prayer before you go, shall we?” I was only too happy to. Looked like we were going to get off without more punishment. Hey, maybe a little prayer would do me good. Of course, let’s pray! The whole thing got started while they were on their knees. Why not? A fitting end. I bowed my head. He wrapped up his earnest prayer….”in the precious name of Jesus, Amen.” I looked up cautiously at Uncle Charlie. Maybe I had been premature. Maybe the punishment phase came now. But he smiled, actually smiled, and asked, “By the way, Stevie, have I ever told you how I learned to drive?” This seemed a very strange question indeed. Perhaps to reinforce a lesson? I would hate to accuse him of lying, but Uncle Charlie?